We know windows are a big investment. Trailblazer's great window line does not come in all the colors some customers desire. We want your windows to fulfill your dreams for your home. So, to provide you with more options we selected NT Windows, and here's why. NT Windows is an ENERGY STAR® Partner, an indication of their commitment to producing quality, energy-efficient windows. This means that when you purchase NT windows for your home, you’ll enjoy reduced heating and cooling costs. In addition to the ENERGY STAR® label for NT windows, they are Gold Label certified by the American Architectural Manufacturers Association (AAMA). NT also belongs to the National Fenestration Rating Council (NFRC), which develops and administers methods to measure the energy efficiency of windows, doors and skylights. Call us at 918-633-1003 and Let us Serve Your Needs. The ENERGY STAR Most Efficient mark is an extension of the ENERGY STAR® brand and is designed to recognize and advance the most efficient products among those in the industry that qualify for the ENERGY STAR designation. The goal of this endeavor is to promote and encourage the development of new, more energy-efficient products into the market more quickly. NT window products, with high-performance glass and insulation systems not only earned the ENERGY STAR mark, but because NT systems give customers greater returns in efficiency, they have earned the prestigious Most Efficient designation provided by ENERGY STAR. What this means is that NT window products bearing these efficient properties give customers an even greater payback on their investment on their new windows. 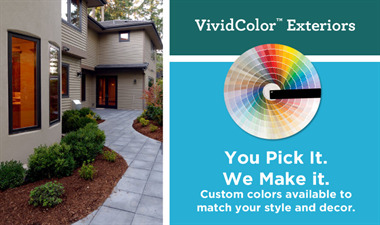 Choose from a wide variety of exterior colors and interior wood grains. Check out the wood grains in this picture. The beauty of these windows is that they offer so many options to chose from to meet your color and style choices. You can have Sage green, Brick Red, Angean Blue, Earthtone brown, and of course whites, ivory, and almond exterior colors to name a few. You can then match them up with cherry or oak on the interior of your home providing warmth and richness.